Surrounded by the Cerro Lopez and Tronador mountain peaks and the Moreno and Nahuel Huapi lakes, the Hotel has a 15-hectare park, including the 18-hole golf course, the marina, beach, solarium, heated indoor and outdoor vanishing edge swimming-pools, Spa and Healthclub with sauna, Fitness Center and other leisure activities. 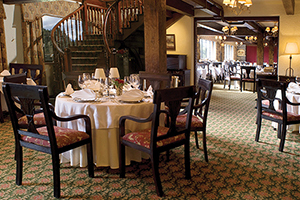 Handcrafted boards of solid wood Cypress and Pine-Hemlock were used for the floorings. 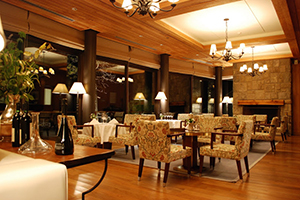 The Hotel has two wings (Ala Bustillo and Lago Moreno wings) and has five restaurants. 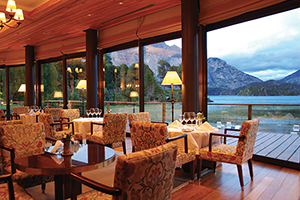 Guests can enjoy a wide variety of dishes, from International Cuisine to our top level traditional food, such as the popular “Llao Llao Tea” which is served overlooking the spectacular view of the Hotel gardens and the breathtaking Nahuel Huapi Lake. Standard Room in Bustillo Bldg. 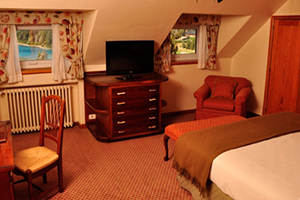 Queen or Twin bedded room with views of our Winter Garden, hotel gardens and park (no mountain, no lake views). Some with staircase access only.Individual heating, TV, minibar, safety-box. Approx. 236 SQF. No air conditioning. Studio in Bustillo Bldg. 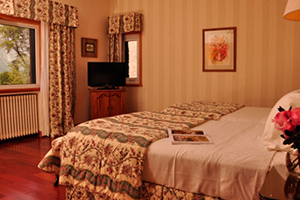 King or Twin bedded Studio with integrated sitting area in an elegant and comfortable space. Renovated bathroom. Individual heating, TV, minibar, safety-box. Approx. 430.6 SQF. No Air Conditioning. Standard 1Bdrm Suite in Bustillo Bldg. 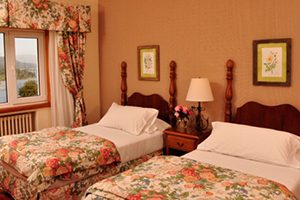 Finely decorated suite with Queen or Twin beds. 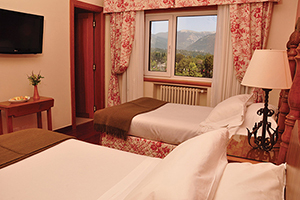 Bedroom and living room – with dreamy views of the Andean mountains and our picturesque gardens. Renovated bathroom. CD Player. 25 TV set. Approx. 516.7 SQF. No Air Conditioning. Lakeview 1Bdrm Suite in Bustillo Bldg. 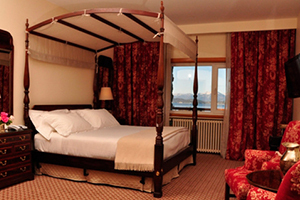 Finely decorated suite – bedroom and livingroom – with beautiful views of the crystalline Patagonic lakes. King or Twin beds. Sofa bed. Desk. CD Player. 25 TV set. Approx. 516.7 SQF. No Air Conditioning. 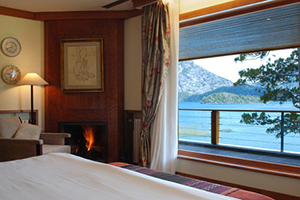 Two beautifully decorated rooms – bedroom and living room – with dreamy views of the crystalline Patagonic lakes. Balcony upon request. Queen Bed. Sofa bed for 2. Desk. Fireplace. Full bathroom. CD Player. 25″ TV set. Approx. 538.7 SQF. No Air Conditioning. Presidential 1Bdrm Ste in Bustillo Bldg. 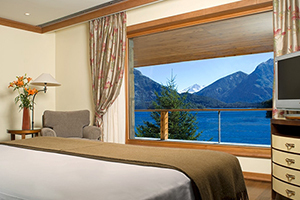 Spacious room with King bed and exquisite decor and a breathtaking view of the Patagonic lakes, the Andean mountains, our magnificent golf course from its 80SQM terrace. Elegant living room, fireplace, dining room for 12 covers and kitchenette. The classic decor of the bedroom and the bathroom featuring double jacuzzi and Scottish shower. No Air Conditioning. Lakeview 2Bdrm Cabin. Dreamy Cabana with beautiful views of the lake. 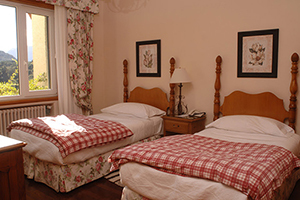 Rooms with 1 queen and twin beds. Two bathrooms. Kitchen, eating room, living room, fireplace, small terrace. CD Player. 25 TV set. 40 mts from main entrance. Approx. 570.5 SQF. No air conditioning. Deluxe Moreno Lakeside Studio. Spacious room with wide windows and breathtaking views of Lake Moreno and Mount Tronador, terrace, compartmentalized bathroom, jacuzzi, air-conditioning, LCD TV. Approx. 538 SQF. King or Twin Beds. Deluxe Moreno Lakeside 1Bdrm Suite- Spacious bedroom, an astonishing bathroom with double Jacuzzi, living room and its imposing fireplace, air-conditioning, LCD TV in both bedroom and living room, and an inviting terrace. 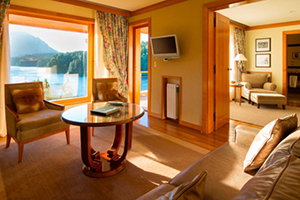 The suite faces Lake Moreno and Mount Tronador from every window. approx. 678 SQF. Privileged location towards Moreno Lake and Mt. Tronador. 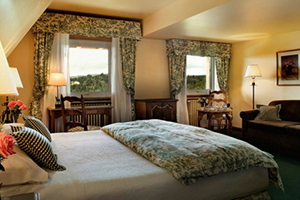 An elegant bedroom with king bed, with terrace, bathroom boasting a double jacuzzi with breathtaking views. Spacious living room with the best view of Moreno Lake to enjoy the eternal snows of Mt. Tronador creating a unique, relaxing atmosphere. 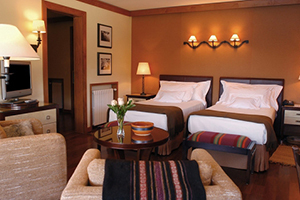 To complete the experience, our Master Suites feature a log fireplace and air conditioning in both rooms (approx. 1033 sq.ft.). Truly unique in every detail, the views, the terrace that opens to a landscape which has been blessed by Nature: the eternal snows of Mount Tronador, the peaceful waters of Moreno Lake and the privilege of an unforgettable sunset. Bedroom with fireplace, bathroom with double Jacuzzi and sauna, dressing room, and a spacious living room with fireplace, kitchenette, toilet and air conditioning (approx. 1399 sq.ft). 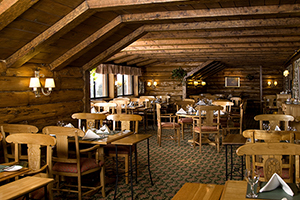 Decorated with wood, this cozy and relaxed atmosphere has beautiful views. 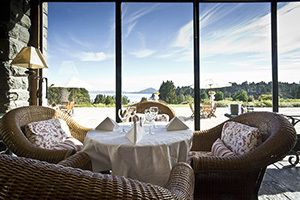 The Restaurant Patagonia coffee shop if the perfect choice for families. Lunch is served between 12:30 pm and 4 pm with tea from 4 pm to 7 pm and dinner from 7:30 pm to midnight. “Los Césares” restaurant offers modern French cuisine in a refined atmosphere with elaborate, colorful and fragrant dishes that delight the senses. 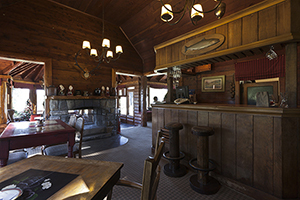 Located on the main floor of the Hotel, this beautifully decorated bar combine wood accents with stone columns, leather upholstery and antler chandeliers give this bar the suitable warms for the environment. In the evening, the lobby bar is the perfect place to enjoy a great variety of cocktails or a glass of champagne. The bar is open from 9 am to 1 am, with Happy Hour from 7:30 pm to 8:30 pm. The scenic windows of the Winter Garden bring the tranquility of the Patagonia landscape into the Winter Garden restaurant. The restaurant is the ideal space to enjoy the hotel’s salad bar or the delicious signature Llao Llao Tea. The salad bar is served from noon to 3:30 pm and Llao Llao Tea is served from 4 pm to 7 pm. 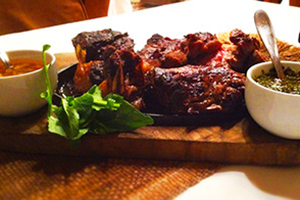 Typical Argentine dishes are served in our Grill – a “criollo” place, where the best Argentine meat is cooked by our asador. 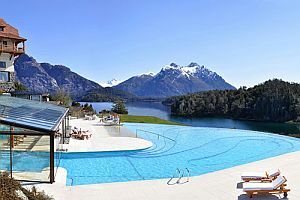 Amid the wonderful scenery, the Llao Llao Hotel’s Club House invites guests to a rewarding break where they can enjoy delicious sandwiches, tea blends, cakes and homemade jams. In the evenings, with advanced booking, guests can enjoy an exquisite cheese or chocolate fondue. The “Moreno Lake Bar” is a unique place. On the shores of Lake Moreno and a privileged view of Cerro Tronador, here you can enjoy a variety of exclusive wines to accompany a menu of salads, meats, soups and sandwiches, plus drinks and coffee options. In the Spa, the hotel has attained the perfect combination of nature and technology. The most modern techniques in facial and body programs both for men and women blend with delicate aromas and scents creating the perfect atmosphere for relaxation and enjoyment. In the Spa experience, the staff cares for the health of guests, while they indulge in the pleasure of relaxing in a uniquely beautiful scenery. 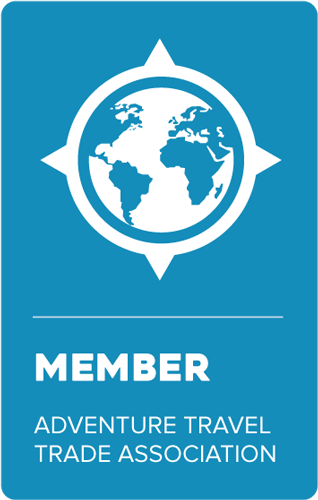 Programs offered include: facial treatments, cell regeneration, detoxifying and revitalizing treatments and hydrotherapy.